This was so much fun to do. Several weeks ago I was approached by Kate Miller-Wilson of LoveToKnow. They have just started a Genealogy section of their site and wanted to interview me. I agreed and I'm so pleased with the finished piece! In this Olive Tree Genealogy interview, LoveToKnow sat down with Lorine McGinnis Schulze, the creator of Olive Tree Genealogy, one of the longest-running genealogy research sites on the web. Thanks to LoveToKnow for the opportunity to talk about two of my most favourite subjects - genealogy and my beloved website! It boggles my mind how some people are not the least bit interested in their family tree. They don't care who their ancestors were. They are not even sure what the word "Genealogy" means. And worst of all, many of these people are family members! How can they not care that their great grandmother struggled against poverty and hardship after arriving in N. America in the mid 1800s? That their McGinnis ancestors were in Ireland during the potato famine, and fled to Canada on a coffin ship at the famine's peak? How can they not be interested in the stories of ancestors who fought in wars, fled from religious persecution, sailed across oceans to unknown lands, struggled in times of famine, or faced other difficulties trying to survive and provide for a family. Our ancestors' blood runs in our veins. Their DNA is within us. I don't understand not wanting to know about them, and by so doing to discover more about ourselves. In my own family are those who don't care at all. These family members won't even look at a photo of their 4th great grandmother in 1867. Wow! That is astounding to me! They don't want to know any names or facts before their grandparents. Their eyes glaze if you bring the subject of genealogy up in front of them. There are also family members who care a little bit. If you tell them some fascinating tale of an ancestor, they listen. But it has to be fascinating! They don't want to hear about ordinary people - farmers, businessmen, housewifes and others who didn't do anything spectacular. But all of our ancestors, the good, the bad, the exciting, the ordinary, are all part of what made us. That's okay too, at least I can drum up interest by only telling those exciting stories and who knows maybe one of those listening will catch a bit of a spark and start researching in the future. Then there are family members who care but not enough to do any research themselves. I understand that. Research can be drudgery. It can be boring. It isn't easy. I'm happy doing the research as long as they care enough to hear about my results! It can be frustrating to be passionate about our hobby of genealogy only to find we have no one with whom we can share our exciting finds. And that's where I'm lucky. My husband is almost as passionate about genealogy as I am. So he is genuinely happy for me and listens attentively when I drone on about a new find or a new lead I'm pursuing. As I do for him. My children are interested. Some of my grandchildren are interested. I really can't complain. But it still boggles my mind to meet people (family members or otherwise) who turn up their noses. A few years ago, a woman said to me "Well, but c'mon they aren't your relatives anymore if they're dead" Hmm.....really? I didn't know family relationships had an expiration date. Does that mean my father and mother are not my parents since both are deceased? When I posed that question to her she had no response. And so my mind continues to be boggled. And probably always will be. After you find your ancestor in the new online index you need to copy all the relevant information and then search the online digitized microfilm. You need to carefully note the Microfilm #, Vol # and Page # for your ancestor from the index entry. You will find the Vol and page #s at the top right of each manifest sheet once you are at the microfilm digitized copy. Then I went to http://www.collectionscanada.gc.ca/microform-digitization/index-e.html and selected BROWSE BY TITLE then picked Passenger Lists: Quebec City (1925 -1935). clicked on T 14750 as indicated in the index results. "mother, age 66, widow, born Ramsgate England, having been in Canada previously from Aug-Nov 1926 at 2 Bala Ave, Mount Dennis, W. Toronto, passage paid by her son Mr E. Simpson, 2 Bernice Cres, Toronto, gives her nearest relative in England as her dau. Mrs. Bruce Walker 164 Homewood Road,Waltham Cross, Herts"
Her passport number is given, also a file number, she has 100 pounds and is a landed immigrant, a housekeeper in England and intends to be one again in Canada. Now I have something new to go on, the fact that she was in Canada in 1926. I should be able to find her in these new online records. Playing The Genealogy Board Game - What Fun! Last month I started making a Genealogy Board Game for my grandchildren. I create a new Genealogy activity for them every year and this year was my biggest challenge and my biggest activity! You can read the first 4 parts about how I created this Genealogy Board Game at Children's Games. A few days ago I explained how I created the UH-OH, CONGRATULATIONS and TRANSPORTATION cards. Well, the big day came. We played the game!! More than once!! My 10 and 12 year old grandchldren loved it so much that they asked to play it again. And again. They offered suggestions and ideas. They laughed when another player had to take an UH-OH card and go back spaces or pay money. They whispered to the dice "please please, 3,3,3,3,3!" as they looked ahead at the board squares and realized that a roll of 3 would land them on a TRANSPORTATION square and they could move ahead. After discussing the game with them, I made changes. I tweaked some items by moving some of the squares. I created more cards with negative consequences because they complained that the game ended too soon the first time we played. My grandson asked for more death cards. Amazing how young children are so macabre. I had only created one death card which related the death of an ancestor and required the player reading the card to return home and start their journey over. Why? Because they too died with the ancestor! I didn't make any more than that one, thinking that it might be a bit too weird or morbid. But they loved it, especially since Grandma (me) got it! So at their urging I created 10 more death cards, each one relating an ancestor's actual death. I confess I tried to find the more lurid and bizarre deaths so as to appeal to their young and morbid minds. I made the consequences such things as "Go back home and seek immediate medical attention" The card stated they too had been bitten by the same dog that bit their ancestor who died a few days afterward. I know - oddly macabre but they loved it. They wanted more squares on the board to make the game last longer so when hubby and I create the final version (this one is a prototype) we'll make the squares smaller to accomplish that. They liked my one detour through the forest of New York with their Loyalist ancestor so I will add one more for the final game board version. We still don't have a name for the Genealogy Board Game. We've tossed around "Journey with your Ancestors" "Ancestor Journey" "Memory Lane" and other ideas but nothing has made us say "Aha! That's it!" There was a lot of laughing, joking and teasing each other when we played. It really was a lot of fun especially when we realized that Grandpa couldn't keep track of how many turns he'd missed when he had to sit out in one of the War Corners. So we could tell him he hadn't missed all his turns yet when in reality he had! All in all it's been really fun playing this game with the kids and I'm excited to make the final version and get it laminated, then try it out on my other seven grandchldren. NBC is airing the four episodes of the original Who Do You Think You Are? series starting on Friday, August 13 at 8/7c. These repeats will air Friday nights and you can expect to see the episodes that featured Lisa Kudrow, Sarah Jessica Parker, Emmitt Smith and Brooke Shields. You might also want to get the companion book Who Do You Think You Are? : The Essential Guide to Tracing Your Family History to follow along. My father died many years ago. It was Christmas Day and just one month after my 14th birthday. My mother had him cremated and his ashes interred somewhere in Toronto Ontario. I was very close to my dad and had a rough time for several years. Several years later, as a young adult and just before I got married I decided to visit my father's grave. I knew he was in St James Crematorium so off I went. Much to my dismay I was told that he was in what we would call "Pauper's Field" and had no marker. I was devastated. I couldn't even visit his grave and talk to him. The years passed but I never stopped thinking about my father lying somewhere in an unmarked, unknown grave. Then one day a very kind man heard about this and took it on himself to find out the exact location of my dad's burial. He was successful! The Cemetery has records which provided a precise location for my father's ashes. Yes it was in a common burial ground and there was no marker with his name but the spot was marked with a tiny marker with a number. While I was thrilled to finally have a place I could visit, it upset me that he had no marker to show his time on earth and for others to visit. None of my siblings even knew what cemetery he was in. After my mother passed away last year I realized I was the only person who knew where he was. 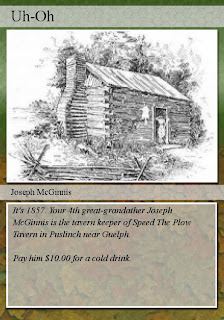 My dad was from Guelph as were his ancestors as far back as 1834. 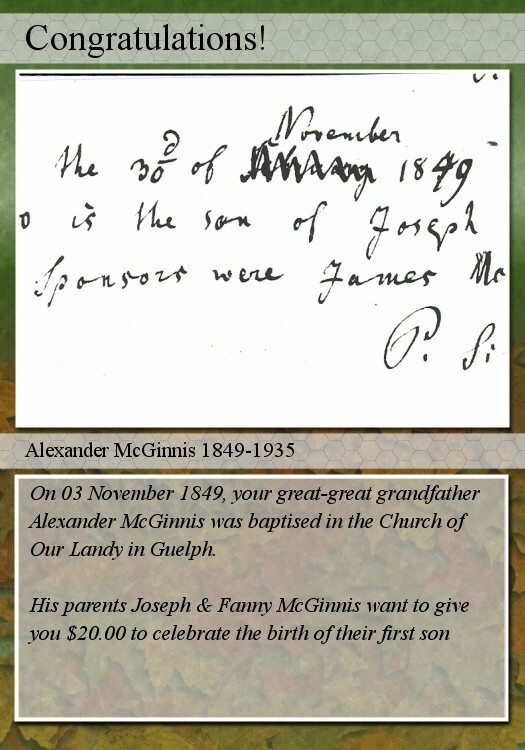 Most of his family - mother, father, siblings, grandparents, great-grandparents are buried in Woodlawn Memorial Gardens in Guelph. So I decided we had to bring dad home to be buried with his family. It surprised me how easy it was to arrange. St James staff were very helpful. My dad was disinterred, his ashes placed in a nice urn for reburial and then he was shipped to my home. I hadn't realized you could do that! The day he arrived at our local village post office was very emotional for me. It took 49 years but my dad was finally home with me and soon to go to his new resting place. 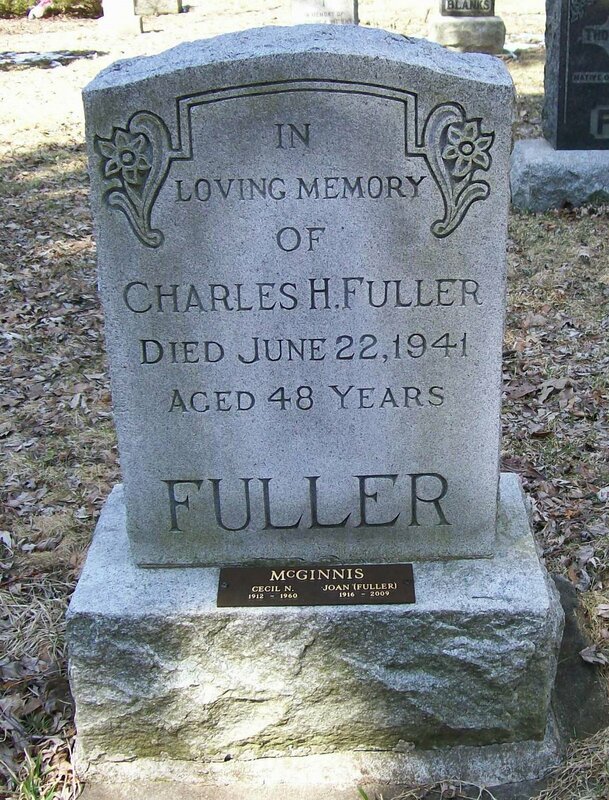 My plan was to take his ashes to Woodlawn in Guelph and have him re-interred with his family. Although it was an emotional time for me, there was humour in the event. When the postmistress went to the back to get my "package" she looked at the sender address (St James Crematorium), wrinkled her nose, laughed and said "Hopefully it's not what it seems!" I responded - "Yes, it's my father"
A startled look came over her face and she apologized for her levity and remark. Wanting to put her at ease (I wasn't offended), I said, without thinking, "No problem, it's okay, he's been dead for 49 years". She looked so horrified that I realized I'd upset her even more! It's easy to forget that not everyone is a genealogist and as comfortable with death as we are. My dad was reburied with my mother and her parents in Woodlawn Cemetery. We had a nice bronze plaque made with both their names and it is attached to the base of the stone already marked with my grandfather's name. And so 49 years later everyone in the family has a place to visit Cecil in his final resting place. I've been busy creating a Genealogy Board Game for my grandchldren this summer. In A Genealogy Board Game For Children Part 1 I explained how I created my Game Board with squares. Part 2 discusses the creation of the actual game board and Part 3 illustrates the UH-OH and CONGRATULATIONS cards I made. 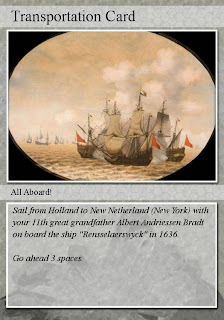 Now to show you the Transportation Cards I created. When a player lands on a Take a Transportation Card square, they choose a card from the pile. Each Transportation Card is about a journey or trip that an ancestor made. Each card has a picture to represent the journey and the explanation below. 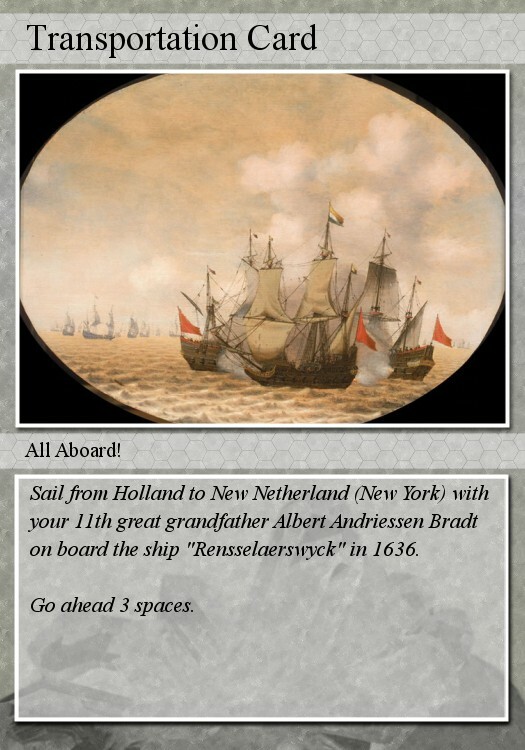 Transportation cards allow the player to move ahead so many squares. 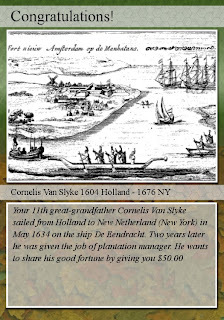 This is a Transportation Card about the voyage of my Bradt ancestor from Holland to New Netherland (New York) in 1637. 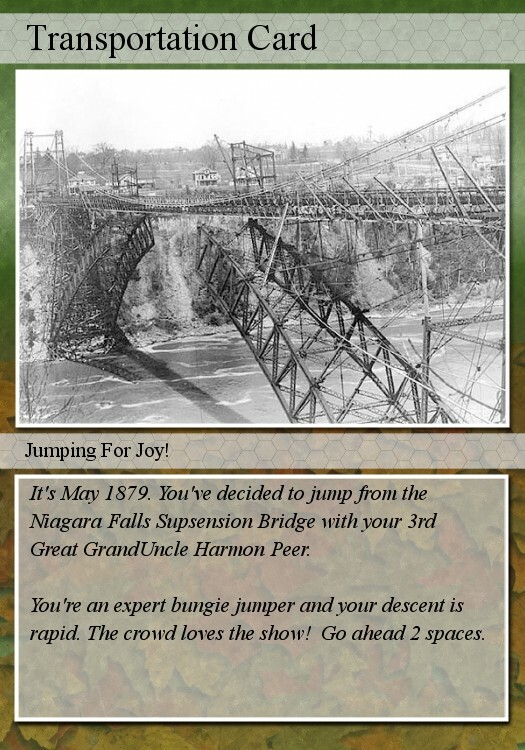 This Transportation Card is about the record setting jump from the Niagara Falls Suspension Bridge made by my great-grandfather's brother in 1867. 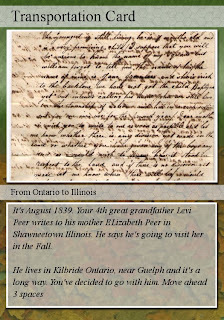 This card is different again, featuring the proposed trip to visit his mother in Illinois mentioned in a letter dated 1839 written by my great-grandfather Levi Peer. After creating all the Transportation Cards (I only made 10 for now) I printed them on heavy yellow card stock. I didn't want them to be the same colour as the UH-OH and CONGRATULATIONS cards which I printed on beige card stock. Next step is to actually play the game! It's still in prototype stage but my grandchildren are with me this week so they are going to be my focus group. We'll play the game and talk about what I can do to make it better, more fun, etc. I want their input and ideas and they've already indicated they are looking forward to playing. I fact they've asked several times since arriving Sunday night. After we play I can tweak the game and work on the final product. More on that in my next post! Yesterday hubby went to visit his grandfather's sister's husband Mac. Both his grandfather and grandfather's sister are deceased but Mac is in his 90s and living in the same town where my husband's family settled in the 1840s. Mac showed hubby several items that belonged to his wife's parents and grandparents - photos, family bibles and other treasures. To my hubby's surprise, Mac gave him everything he could find including a mustache cup that belonged to hubby's great-great grandfather Sam Sandercock. Co-incidentally we have a small collection of mustache cups in our home. Sam was Mac's wife's grandfather and it seems she inherited some family treasures when Sam died in 1949. Because she and Mac had no children, Mac has no one to give these items to. So hubby came home with a very pretty mustache cup which has extra meaning because his great-great grandpa used to drink from it. I'm so glad that these items have been treasured and now passed on to my husband who in turn will treasure them and treat them with great care. This blog post has nothing to do with genealogy. It's about something that happened to me many years ago (33 years to be exact). It's been on my mind a lot recently although I don't know why. When my oldest son was 4 years old, the two of us flew to Florida to visit my mother for a week. We used an airport near Naples Florida, but I can't recall the name. On the day we were to fly home to Canada, we discovered that the airline had gone bankrupt. Somehow we managed to get a flight to New York - I honestly can't recall details as I was quite distressed by the turn of events! Flying to New York was a nightmare as we had to keep landing and picking up new passengers. I guess we were on some kind of commuter plane. My son and I were both hungry as we'd had nothing since a quick breakfast with my mom but all that was on hand were bags of peanuts. We are both allergic to nuts so we went hungry for many hours. I was told that after I landed in New York I had to take a taxi to another airport to catch my last flight which would take me to Toronto where my husband would be waiting for me. But that was going to be several more hours. My 4 year old son was crying with hunger and I had no money to buy food when we landed. Nor did I have money for a taxi! I'd been chatting with a man sitting beside me on the plane. He showed me pictures of his wife and family and we shared stories. When he heard me telling my son that he had to be patient as I had no way to buy him food, he immediately insisted on buying us lunch in the New York terminal. I wanted his name and address to pay him back but he refused, saying it wasn't necessary and that he hoped someone would do the same for his wife and son if they were ever stranded. So we had lunch with a very kind stranger who then made sure my son and I were safely put into a taxi (which he paid for) and that the driver knew exactly where we were to go. My son and I both waved as the driver pulled out. We did arrive safely home, some 14 hours after we started out that morning, exhausted but glad to be safe and sound. That was the last I saw of this kind stranger but I have thought about him over the years and hoped that his kindness was repaid. I don't know why I've been thinking about that event but it's been on my mind a lot. I think it's time I acknowledged his kindness even though I do not know his name. So whoever you are, wherever you are - thank you. I've talked about creating a Genealogy Board Game for my grandchldren this summer. In A Genealogy Board Game For Children Part 1 I explained how I created my Game Board with squares. You can also read Part 2 which continued discussing the creation of the actual game board. The ? pile consists of laminated 3x4 1/2 inch cards. These cards are either an UH-OH card or a CONGRATULATIONS card. 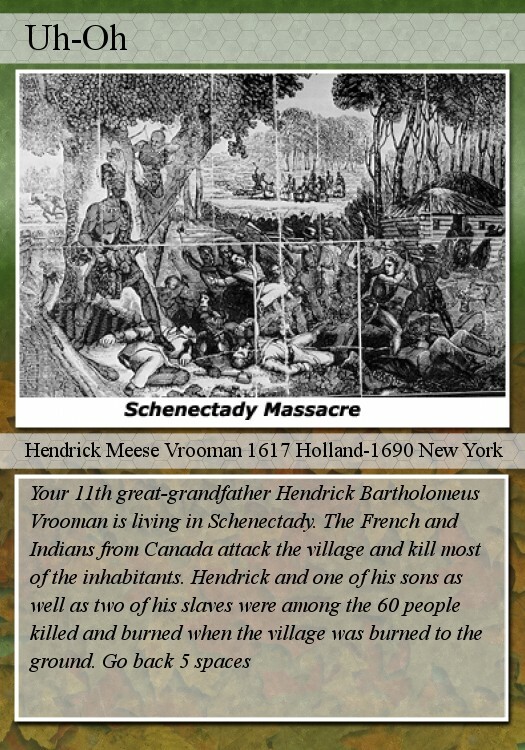 Each card describes an event that actually happened to an ancestor. Example: the marriage of Alex McGinnis and Harriet King. The ancestor's relationship to my grandchildren is noted, as in "Your 5th great grandfather...."
Each card requires the player to do something - the UH-OH cards require that a player give up money or lose a turn or both. The CONGRATULATIONS cards allow a player to receive money or move ahead a certain number of squares. 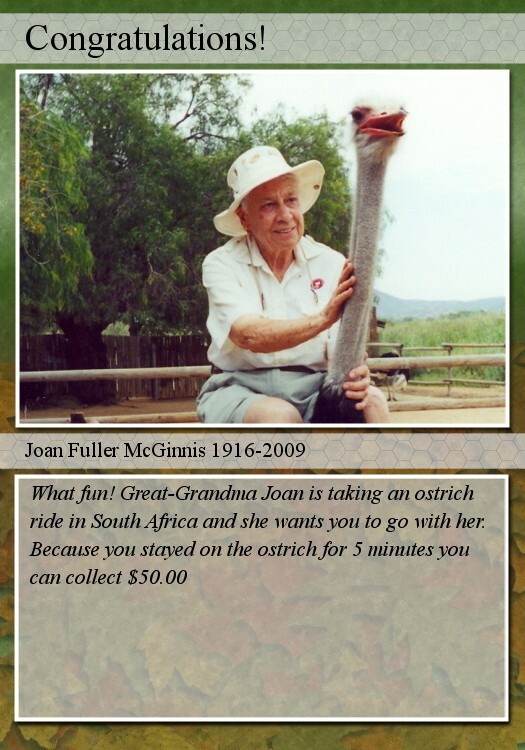 The top half of each card has a photo or drawing of the event or the ancestor. 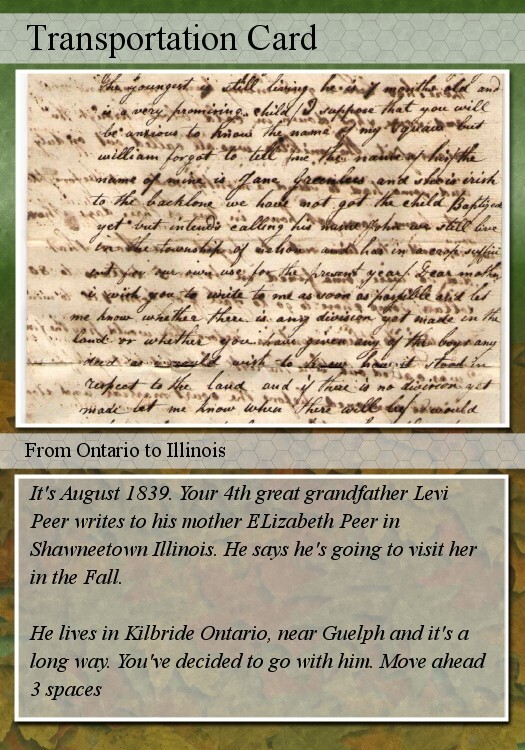 For example, the card I created about the will of Jacob Peer in 1815 has an image of the will. The card for the marriage of Alex and Harriet has the marriage certificate. The card for an event about my grandfather has his photo. The bottom half has the event and the consequence. I describe what happened (the event), give the year and ancestor name, then a logical consequence. For example a wedding could be an UH-OH Card. The player might have to pay to buy a wedding gift, or a new suit. They might have to miss a turn to attend the wedding. It could also be a CONGRATULATIONS card - perhaps the happy couple is celebrating and giving family members money! It is circa 1912. 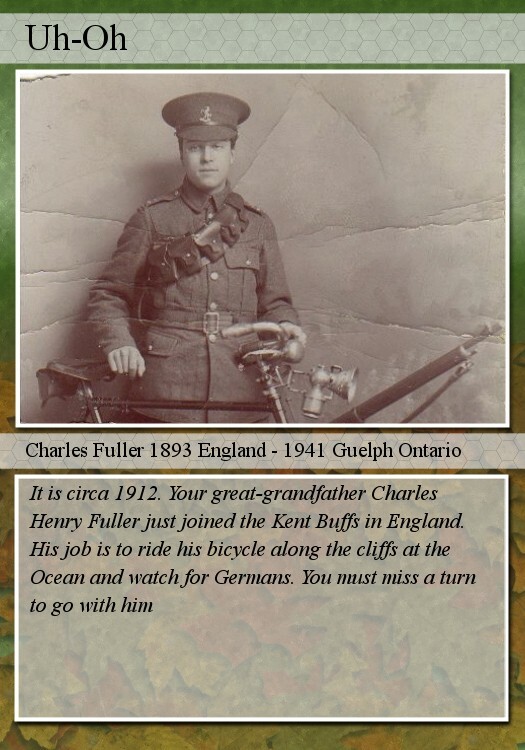 Your great grandfather Charles Henry Fuller has just joined the Kent Buffs in England. His job is to ride his bicycle along the cliffs at the Ocean and watch for Germans. Your must miss a turn to go with him. These are examples of the 50 ? Cards I created. They go face down on the ? square in the middle of the game board. I'll describe the Transportation Cards and how the game board has developed to final stages in my next two blog posts so be sure to check for it in the next few days. His surprise at finding this out made me realize I know a lot of things that other family members don't. And I have a lot of items - newspaper clippings, photos and so on, that other family members have probably never seen. It seemed to me I needed to start creating family booklets which contained all this information. That's not as easy or quick as it might seem, because I have become the unofficial keeper of the family papers and photographs. It started when I was about 16 and my grandmother gave me her "stuff". Every time someone in the family passed away, their "stuff" ended up with me. I'm not complaining, but it's a lot of "stuff" to sort and organize before it is ready for a booklet. 1. Decide what your focus is for your booklet. I wanted to provide photographs and newspaper clippings plus a few documents for my generation (my siblings and I), my parents, my McGinnis grandparents, my great-grandparents and my great-great grandparents. You could focus simply on your generation and your parents, the choices are endless. 2. What size will your booklet be? I made mine on 8.5x11 inch paper, portrait orientation. 3. How many pages will you include? I didn't decide on a specific number other than less than 25 pages. I just kept adding photos until I decided I was done. Actually in my case, my LaserJet Printer ran out of black ink and that ended my project. 4. Think about your audience. What format will you use for your booklet for that audience? Since my booklet won't be in the hands of any avid genealogists, I wanted it to be easy to read, not too many dry facts, and appealing enough to be looked at more than once. I decided to do brief write-ups on the first 3 generations down to my parents, each write-up giving a few basic facts interspersed with images. I used a program called PictureIt! to create these pages. When I got to my parents' section, I started adding photographs, the more the better. I tried to focus just on our direct male ancestor and not get side-tracked by siblings or spousal lines. Adding photos and documents for siblings and spouses would have meant creating a huge book, not a booklet. For myself and my siblings I didn't provide any text, just photos. My next section was a scrapbook type section, created in Picassa using the Collages feature. I created several pages of scrapbook photos complete with captions. These pages were focused on my mom and dad and my siblings and myself. Some things I mulled over were whether or not to include death certificates. I decided against it because I felt that my family members would not want to read such an item (again - they are not die-hard genealogists!) These are all personal decisions and keeping in mind who will be receiving your booklet helps you make a decision appropriate for that audience. One item I added was a family tree chart of head shots of our ancestors. It doesn't follow our McGinnis line exclusively because I only have some ancestors' photographs. So these were the ones I put in my chart. Last, I created a cover page on card stock, laminated front and back and then bound the entire booklet together with a coil spine. Here is an example of the finished product (two pages from the completed booklet) which will be given to my brother and nephew today. When my mother passed away last year, my brother and I cleared out her apartment. We were rushed and I brought home items that we hadn't taken the time to open that day. 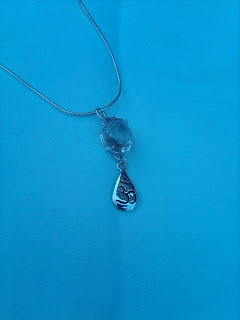 When I opened a small box a few months later, I found a dozen or so loose gemstones. Nothing valuable, some were coloured glass, and four were topaz. I wasn't sure what on earth to do with them. They weren't valuable except obviously they meant something to my mom. While they could be kept, the odds that anyone would treasure them and pass them on through the generations as a memento of my mother were slim. Then my niece said she had an idea. 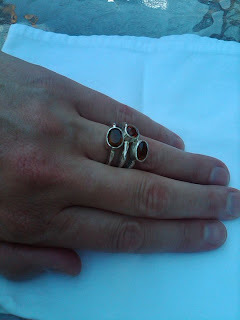 She took the gems to a friend of hers and had custom pieces of jewellery made from them. My niece just sent me some photos of what she had made and I'm so impressed I wanted to share the photos with others. 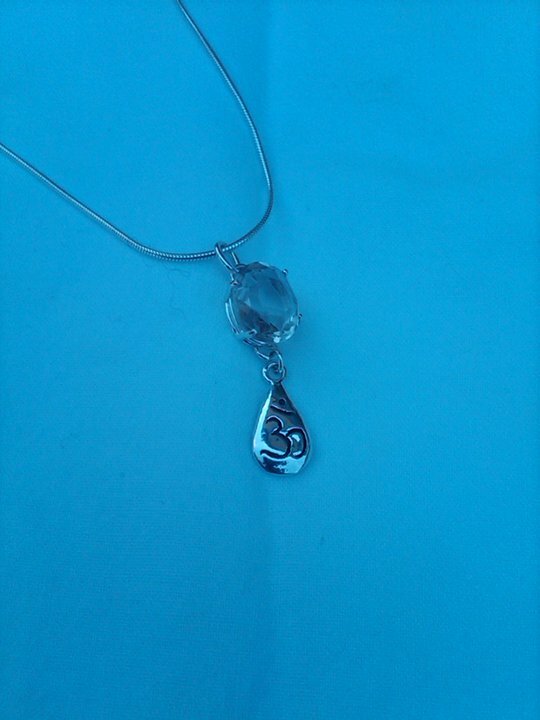 It was very creative of my niece to think of this, and a wonderful way to pass those gemstones on to others who will hopefully think of my mother when they wear them. So loose gemstones that would have been lost over time have now been transformed into beautiful jewellery that can be worn and passed on as a family memory of my mother. Thank you Risa for your great idea! 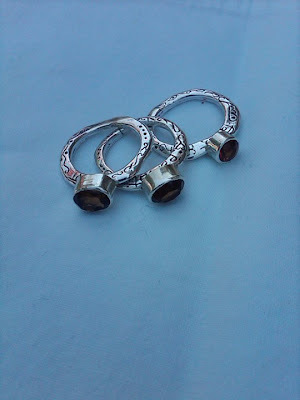 Enjoy your gorgeous jewellery made from stones that belonged to Grandma Joan. A few days ago I wrote about my great grandfather's brother Harmon P. Peer in When Family Lore Turns Out to be Even More Exciting. 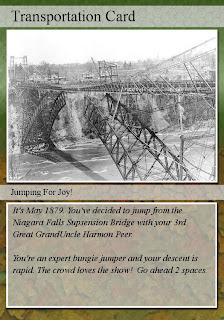 Harmon jumped from the Niagara Falls Suspension Bridge in 1879 and I thought, died in the attempt. But the newspaper extract I had was incorrect! He didn't die that day, in fact quite the opposite. With the help of several readers, much more was found about Harmon. When Harmon made his leap in May 1879 he was not suicidal. He was not being impulsive. He was a performer, a daredevil and with his cousin Steve Peer, he put on a show for the crowd of 1,000 spectators. According to various newspapers in USA, Canada and even Australia, Harmon set a record for base jumping that day, beating Sam Patch's former record by over 100 feet! In fact an Encyclopedia about Stunts and Base Jumping states that Harmon was the first recorded base jumper. While his cousin Steve, who was a well-known tightrope walker and former assistant to Bellini, performed a few gymnastics for the crowd, Harmon circulated and collected money for his performance. Apparently he only collected $11.00 that day but the crowd was thrilled by his act. Wearing tights, stockings and a leather harness, he was fastened by a thin cable to brass rings at his shoulders, which then looped around a cylinder which allowed him to free fall but remain upright. He fastened elastic around his legs and feet to hold them together and wore a cone-shaped life ring which also helped keep him upright in the water. In his mouth and nose he stuffed sponges, and smaller ones were inserted in his ears. After jumping into the Niagara River, a distance of 192 feet below, he popped to the surface and was picked up by waiting boats. He then announced that he would repeat his jump on July 4th. July 4th came and over 5,000 people gathered to watch the show. His cousin Steve Peer was on hand to entertain the crowd too, and according to newspapers, Steve ran up and down the beams of the Suspension Bridge, a very difficult task due to their angle. Harmon arrived, very drunk according to newspaper accounts, and collected a rather large sum of money! But then he refused to jump and had to be rescued when the spectators became an angry mob. Newspaper accounts provide quite a bit of detail on the botched leap. We next hear of Harmon on August 6, 1879 when he made a leap into Lake Ontario from the steamer Empress of India. This was only a small leap of less than 100 feet from a derrick on the deck of the steamer as it made it way out from Toronto. Apparently Harmon was rather intoxicated at the time, and on the return voyage made a nuisance of himself. According to one paper, he "stamped himself a first class rowdy" by becoming drunk and using "insulting and blaphemous language to passengers, both male and female"
Harmon disappears from Canadian records after that date, but thanks to my readers, he was found in Cleveland Ohio with a wife (not the wife he left in Ontario!) and children. He is perhaps the Harmon P. Peer who died alone in Philadelphia Pennsylvania in 1903. Unfortunately his parents' names are not given on the death certificate but other facts fit. Why do I call him the Forgotten Man? Because he is not on the list of Niagara Daredevils although Sam Patch, whose record he surpasssed, is. He is not in Pierre Berton's book on Daredevils of the Falls. Why is Harmon not included when he is found in so many newspaper writeups with proof of his jump and the record for distance? He may not have been the kind of fellow we want for a friend (or relative!) but he did set a base jumping record and he deserves his place in history. Last week I joined my brother and nephew and families for a dinner out. During the evening I showed them a booklet I was creating for our McGinnis family ancestry. My nephew expressed surprise that my mother and father (his grandparents) had been married in a double wedding ceremony with my mother's sister. This was news to him! This may seem like a small thing but I was startled. That double wedding was something I heard about as a young child. I have the wedding invitation. I have newspaper articles about the two sisters in Guelph who were to be married in a double ceremony. I have articles about their showers, their trousseau teas, their wedding and their honeymoon plans. I have a photo of my mom and dad standing on the steps of the church on their Wedding Day. I have a group photo of the Wedding party. So for me, this is old news and something I know as if it happened to me. I figured everyone in the family knew. It never occured to me that my nieces or nephews might never have heard of it. Didn't my brother ever mention it? Did he know? I suddenly feel quite a bit of pressure to spread the word! To share the stories and the facts I've known for so many years. I think it's time for me to put together a little booklet with all the events in my parents' and grandparents' lives that I've known about for years. Maybe I'm the only one who knows and boy that worries me. I made an error by assuming everyone in the family knew of this special day. What else don't they know (that I do). I grew up hearing stories. My mother, grandmother and aunt all told me stories of their childhood and their lives. I asked for the stories over and over again. They showed me clippings from newspapers. My mom had a scrapbook (which may actually have been my grandmother's, my memory is fuzzy on that) which she eventually gave me and that is where all the newspaper clippings, the wedding invitation, etc were. Maybe that's why I am a genealogist. I love hearing the stories, learning about the people living their daily lives. It's not about the names or dates or going back the furthest in time. For me it's all about the people - who were they, what events did they experience, what emotions did they feel, how did they live their lives... these are important to me and finding the answers to those questions make my ancestors alive for me. It's one small step but it's a start. Exciting News from FamilySearch! This sounds like a wonderful idea and very timely. Here's hoping I will be able to make it. SALT LAKE CITY­—Technologists and genealogists from around the world will gather at the first annual RootsTech Conference in Salt Lake City, Utah, February 10-12, 2011. The new conference, hosted by FamilySearch and sponsored by leading genealogical organizations, aims to bring technologists and genealogists together to help deepen understanding of current technologies and discover new ideas in applying technology to genealogy. Learn more at rootstech.familysearch.org. Who Do You Think You Are Repeats Start Tonight! NBC is planning to re-air four episodes of the Who Do You Think You Are? series starting on Friday, August 13 at 8/7c. If you missed any episodes when this series premiered a few months back, you won't want to miss this chance to watch! I watched all the episodes and found them very intriguing. So don’t forget to tune-in to the reruns of Who Do You Think You Are? starting on Friday, August 13 at 8/7c and enjoy the show! When Family Lore Turns Out to Be Even More Exciting! 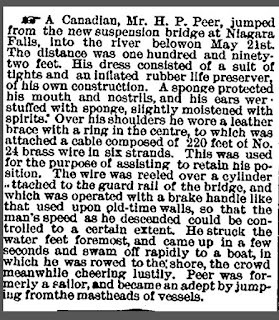 As a teenager I heard stories about my great-grandfather's brother who walked Niagara Falls on a tightrope in 1880, and sadly fell to his death. My uncle Roy claimed he had a newspaper clipping about this but couldn't find it. I was intrigued but a bit skeptical. Niagara Falls? Tightrope? Nah.... But my uncle insisted and told me that the name of my great-grandpa's brother was Harmon Peer. 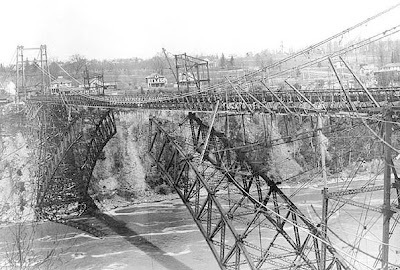 Many years later I discovered that Stephen Peer, a cousin to my great grandfather, had indeed walked Niagara Falls on a tightrope and fell to his death. The year was 1887. He has the dubious distinction of being the only person to ever die walking the Falls on a tightrope. Hmmm... most of the "facts" fit. But his name and relationship to my great grandfather weren't quite right. The year was wrong, but family lore is often a bit vague and not quite right. Was this the man? 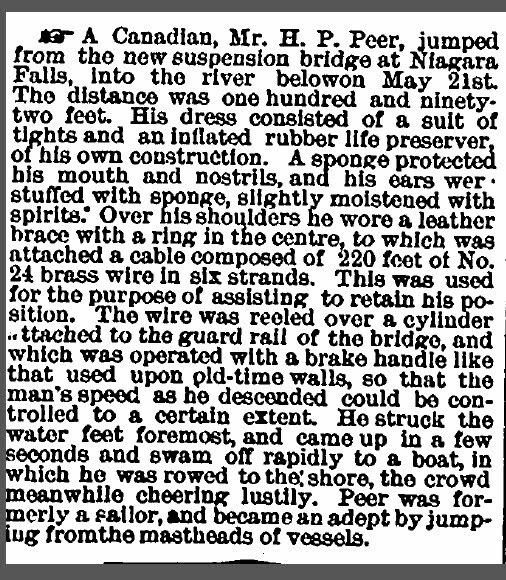 Then I found a newspaper extract about a man named Harmon P. Peer who tied a thin wire cable to his ankles and jumped from the Niagara Suspension bridge in 1879. According to the extract, he died in the attempt. A check of my genealogy files and bingo! There was my great-grandfather Stephen Edward Peer and his brother Philip Harmon Peer! The ages were correct. The year of death was within one year. I had my man. I was satisifed. Never gave it much more thought, it was just an intriguing tale to tell my grandchildren. I did wonder though why he tied that cable to his ankles before he jumped. Was it suicide? It seemd an odd way to do it. A stunt? The Peer family was known for its daredevil ways, perhaps he was the first bungie jumper! So I went on an Internet hunt. Lo and behold I found a dozen newspaper reports in the USA and in Australia (yes, Australia) about Great great uncle Harmon Peer from Teetersville Ontario. It seems Harmon was a jumper. He was a showman, his jumps were planned and executed with precision, and he attracted huge crowds of specatators! It was fascinating to read about his successful jumps from the Niagara Suspension Bridge and how he got his start - jumping from the Watson & Co. Elevators in Milwaukee, a distance of 62 feet. I haven't yet found a newspaper article that describes that jump in detail and I can only estimate the year - around 1870-1875 most likely. By the time he made his record-setting jump from the Niagara Suspension Bridge he was about 36 years old. It was May 21, 1879. He dressed in tights with a wide rubber life-preserver fastened to him. It was funnel shaped and went from his hips to his armpits, allowing freedom of movement in the water. A sponge was tied over his mouth and nose, and two smaller sponges stuffed into his ears. I'm not making this up, it is all in the newspaper articles. A leather shoulder suspender with two brass rings at his shoulders came next. To the rings was attached a thin brass wire to assist in keeping him upright. A wide elastic band just above his knees and a second around his feet to keep them from spreading completed his outfit. For the May 21st jump he had a wooden platform suspended out from the bridge but for earlier jumps he simply fell over the bridge railing. The May 21st jump gave him the world record of 192 feet. He completed the jump successfully and I have not yet found an article regarding his death. So now I have to ask myself - did he die? Or was the extract completely wrong? According to all the 1879 newspapers I found (The Mercury in Hobart Tasmania, The Hawaiian Gazette, Janesville Wisconsin Gazette, Jackson Sentinal in Iowa and others) Harmon intended on making another leap off the Niagara Bridge on July 4th 1879. I am now seeking some evidence of this July 4th jump or his death! Without online access to Ontario newspapers my hopes lie in the American or Australian ones but so far no luck. I am also hoping to find a newspaper story about the Watson Elevator jump in Milwaukee. Another interesting tidbit (if true!) in some of the newspapers was that Harmon had fallen from the mast of a sailing boat sometime around 1870 in the Caribbean, then again in Milwaukee from another vessel. I wasn't aware he was a sailor so am not sure if this was true or he was inventing tales to help promote his jumping. But what a story! What a great find. To think that my Uncle Roy's story was pretty close to the mark. It just goes to show that although family lore is often myth, it just as often has a kernel of truth. In this case it was merely taking two true events and confusing them as one. This year I'll have even better stories to entertain my grandchildren. Harmon Peer the jumper and Stephen Peer the tightrope walker are both in their family and chidren love stories of adventure and stunts and daredevil relatives. I just hope it doesn't encourage the same actions from them! Oh, and if anyone has access to newspapers that might carry some stories about Harmon Peer, I'd be overjoyed to know about them! I've talked about creating a Genealogy Board Game for my grandchldren this summer. In A Genealogy Board Game For Children Part 1 I explained how I created my Game Board with squares. The next thing I did after making my blank squares was to think about what text I would have on those squares. What would happen when a player lands on each square? Would they have to pick a card from a Reward/Punishment pile? From a Transportation Pile? Or would there be text printed right on the square with some action they had to take? I had some ideas for the squares along the outside edges but wanted to also figure out what to do with the 4 corner squares. Would I create a type of detour, sort of like the sliders in Sorry? Or would I create physical detours, a path that diverted from the main squares and had something to do with an ancestor? As an example, I could create a path with stickers (little footprints) called Northern New York Forest Trail. 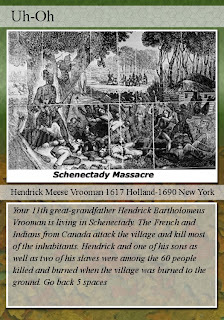 It would be the path taken by their ancestor Mary Vollick during the American Revolution when her home in northern New York was burned by the Americans and she and her 10 small children were marched into the woods and left there to make their way to Canada or die. So a player landing there would have to detour through this path to go with Mary and her children to safety in Canada. I played around with this for a bit but didn't create it. Instead I decided that each of the 4 corner squares would require the player (if he/she landed there) to join an ancestor in a War. You can see the 4 War Corners here as well as the War Areas where the player sits out a few turns. "The American Revolution has broken out. You enlisted with Isaac Vollick in Butler's Rangers. Go to their barracks to get your uniform and miss 2 turns then return to this square"
The other 3 corner squares represent War of 1812 (another ancestor fought in that one), WW1 and WW2. All of these saw our ancestors fighting and so each square talks about something specifically related to that ancestors. The War of 1812 square allows the player to make a choice - either miss 2 turns to join Stephen Peer at the Battle of Chippewa in 1814 or pay another player to take their place. I thought this would add an interesting twist to the game. Here the player who landed on the square can negotiate with other players. They will want to offer money to get another player to sit out 2 turns in the War of 1812 square. It should be interesting to see the bartering that takes place! WW1 states "It's August 1918. WW1 is raging. Edgar Peer is off to France. Join him at the Battle of Amiens. Miss 2 turns"
WW2 is about my father who was a Lieutenant in that War. Again, the player who lands there has to miss 2 turns. Each corner square has a respective larger square turned kitty corner to the War Square. It contains a photo of the soldier in that specific war or representing that soldier, as well as a brief descriptive title. That is where the player sits out their turns while waiting to rejoin the game. In an earlier post I talked about How to Use the National Archives United Kingdom Website to Obtain Ancestor Documents. One of the items I found, and ordered, was a Removal Order. On 18 MAY 1778, a Removal Order was served on my 5th Great Grandfather THOMAS BLANDON, DRUMMER in the Western Battalion Militia of Suffolk. I also ordered two Bastardy orders and one Bastardy Examination for my ancestors. These were for the year 1791 and held at Suffolk Record Office, Ipswich Branch. One document was a Bastardy maintenance order for the female child of Hannah BLANDON (my 4th great grandmother) by James King, late of Chediston, husbandman. The order and examination papers gave Hannah's place of residence, marital status (Single) and exact date of birth of her daughter. James King, my 4th great grandfather, was named as the father and did not deny the charge. James and Hannah had at least two more children - my 3rd great grandfather Thomas King being one of them. I have not found a marriage record so do not know if the couple ever married legally. But their Bastardy Examination and Orders provided me with more detail on James and some interesting anecdotal information on Hannah. There are other English records which provide details that may help in tracing an illegitimate ancestor. The following news release has just been distributed on the wire by Ancestry.com. PROVO, UTAH (August 6, 2010) – Ancestry.com Inc. (Nasdaq:ACOM) announced today that it has acquired leading professional genealogy research firm, ProGenealogists, Inc.
Based in Salt Lake City, Utah, ProGenealogists specializes in genealogical, forensic and family history research. During its 10-year history, the firm has become a trusted name in professional genealogy, finding great success with client research and expanding both its domestic and international capabilities. As a part of Ancestry.com, ProGenealogists will continue to provide premier family history research to its existing clients while extending the Ancestry.com reach across the genealogy value chain. Terms of the transaction were not disclosed. Ancestry.com does not expect the acquisition to have a material impact on its financial guidance as issued in connection with its second quarter earnings release on July 29, 2010. ProGenealogists and Ancestry.com have worked together on several initiatives over the past few years including driving the research for the NBC television program, “Who Do You Think You Are?” which traced the family histories of celebrities including Sarah Jessica Parker, Lisa Kudrow, Brooke Shields, Susan Sarandon, Emmitt Smith, Matthew Broderick and Spike Lee. Ancestry.com will continue leveraging the expertise at ProGenealogists for similar initiatives in the future. Well it's that time of year again. Every summer my two oldest grandchildren (ages 10 and 12 this year) come for a week's visit. And every summer for the past 5 years I have come up with a new Genealogy activity for them. We've done a Genealogy Cemetery Hunt) (looking for a specific ancestor's tombstone that I know is in the Cemetery). They love that one! 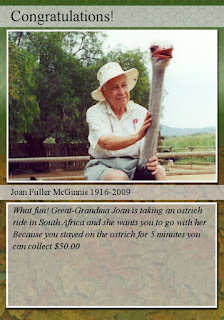 We've done Ancestor Cards for Children. 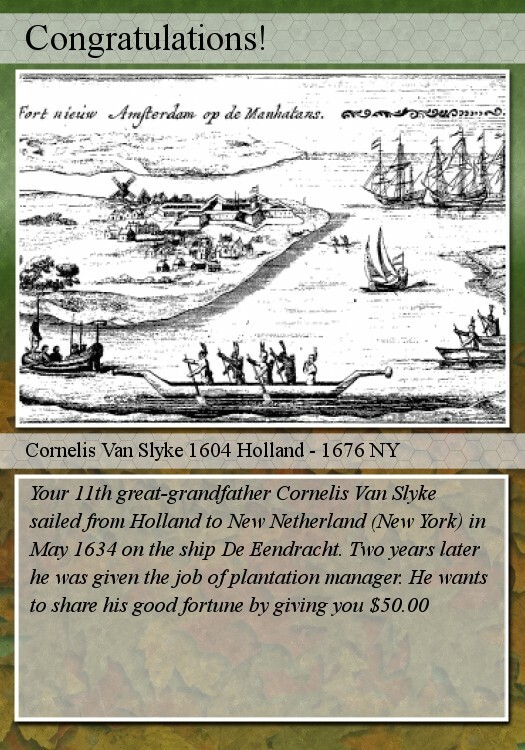 In this one I created a deck of playing cards with ancestor's photos and brief biography on each one. They seem to love that one too. We've done lots of other genealogy activities such as Making a Genealogy Time Capsule part 1 and creating a Genealogy Remembrance Garden, but this year I needed something new. A few weeks ago I decided to make a Genealogy Board Game. I'm really pleased with how it's progressing and want to share it with readers. You might want to create one for your children or grandchildren too. Because this Genealogy Board Game is a work in progress I'm going to start at the beginning and guide you through my thought processes, my brainstorming sessions with hubby, and my trials and errors. So over several blog posts I'll walk you through and show you photos of my progress. Of course ideas and suggestions from readers are always welcome! The first thing I did was decide what I wanted to happen during the Board Game. How could I work Genealogy and learning about their ancestors into throwing dice and moving a token around a board of squares? What would the objective (end result) be? What would happen along the way? What would I call the game? First things first. After a few days of brainstorming and thinking I decided that the game would consist of moving a token around the board (easy part!) and every square landed on would require that a card be taken. Cards would have either a postitive (move ahead, collect money, etc) or negative (lose a turn, go back, pay money) impact on the player. Pretty basic standard board game procedure so far. But I would be applying a genealogy twist. Every card would have something to do with our ancestors. For me, the cards were the easiest part of the game! I knew exactly what types of penalties or rewards I would have on each one. So I confess that I created my cards before I created the board or decided on the method of moving around the board or the end result. I don't want to get ahead of myself so let me pretend that I created the physical board first (I didn't, it came much later in my thought process). I bought 2 big pieces of white bristleboard. One is for my board prototype. The second piece of bristleboard (if I use white - who knows, I might switch to a coloured piece of board) will be for the finished product which will be carefully glued or fastened down and then laminated. I wanted to create squares for the board but ended up creating rectangles for no reason other than ease of creation and room to add text. I tried several methods for square creation. Remember this is trial and error! I created squares with text. I created blank squares. I created squares of different colours. I created identical squares. In short, I tried at least 10 types of squares before deciding to start with blank identical squares. I would create my text squares later after getting a visual feel for the layout of the board. Using a very old program called PICTURE IT! I created blank squares that look like old scrolls. I chopped them with my paper cutter and started taping them down. They didn't fill the white bristleboard evenly but no problem - I cut the edges off the bristleboard to make it even with the end of the squares. Here is a photo of my squares and the start of taping them to the bristleboard. Next I decided where HOME would be. I then created a HOME logo, cut out four identical ones and taped them down on the board. Next came four small squares for each HOME area, leading from home to the outside edge of the game board. I used four different colours and will eventually have four tokens matching those colours. So each person playing the game will have their own colour. In order to decide on physical placement of items on the game board I quickly cut out (using my paper cutter) coloured card stock to represent the two piles of cards I will be creating. These cards as you can see from the next photo, will go in the middle. I will explain what these piles are in another blog post when I talk about the actual cards. But for now let's concentrate on the game board which was a really interesting evolutionary item to create. I use the term evolutionary because I changed the layout several times. I ended up keeping these squares (but added squares with text which you will see later) and so far I've kept the HOME logos (although I have a feeling I'll change those). But I changed the small coloured squares leading out from HOME to the game board squares. You'll see what I did in another post on this topic. I have slightly over two weeks to finish (gulp!) so I have quite a bit to do and may have to take a few shortcuts but I'm pretty sure the grandchildren are going to love this game. And boy are they going to learn a lot about their ancestors! I call it Genealogy brainwashing and I'm not ashamed to use it. Two years ago I wrote a blog post called A GRAVE MISTAKE It was about how you can't always be positive that what is written on a tombstone is correct. A recent email on a mailing list brought this subject back to mind. A subscriber was trying to find his ancestor's death certificate. He had dates of death and birth from the tombstone. But he could not find the death certificate and his conclusion was that it had not been registered. But wait! Did the subscriber allow any leeway in death dates? Nope. He trusted the gravestone inscription and didn't bother to search a few years either side. It always surprises me that if a document is not found with a preliminary search, researchers often give up. We really need to remember that information on most records, for example on a death certificate, on a census, on a marriage record, a church baptismal record, an obituary and yes - a tombstone - is only as good and as accurate as the knowledge of the person providing the information! If the informant doesn't know the correct age, or place of birth, or only knows a nickname but not the name given at birth, then that information will be wrong or not recorded. Gravestones are almost always placed by family, and often well after the actual death. Memories can be faulty and incorrect information can be recorded for posterity. 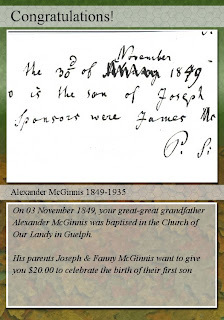 Alexander McGinnis (my great grandfather) was born in 1849. I have his baptism record giving his actual date of birth. But his daughter Mary erected his tombstone and she thought he was born in 1844. So that date went on the stone. It's wrong. If I had not allowed several years on either side of that tombstone year, I'd not have found his baptism. Mary Elizabeth Peer (my great grandmother) was the daughter of Isaac Vollick and Lydia Jamieson. That is proven. Her husband was Stephen Peer. But her death certificate states that her parents were Stephen & Mary Vollick. How did this happen? When she died her 17 year old son Edgar gave the information and I speculate when asked "Mother's name?" by the registrar, he said "Mary" (his mother's name). When asked "Father's name?" he said "Stephen" (his father's name). When asked "maiden name?" he gave the correct maiden name of his mother - Vollick. And thus the fictitious and entirely incorrect couple called Stephen and Mary Vollick were created and worse yet, listed for posterity as the parents of Mary Vollick! And that is how mistakes happen. So be creative. Think outside the box. Don't believe that something, once written, is set in stone. It may very well be wrong. Genealogy Without Sources is Mythology!